FINALLY, ASPARAGUS: A MARKET STORY | Jane Lear. Writing on Food and Travel. 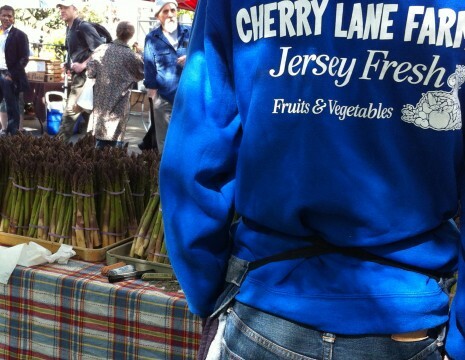 I busted loose at the Union Square market this week. Lilacs. Crabapple blossoms. Buttercups, one of the world’s most joyful flowers. 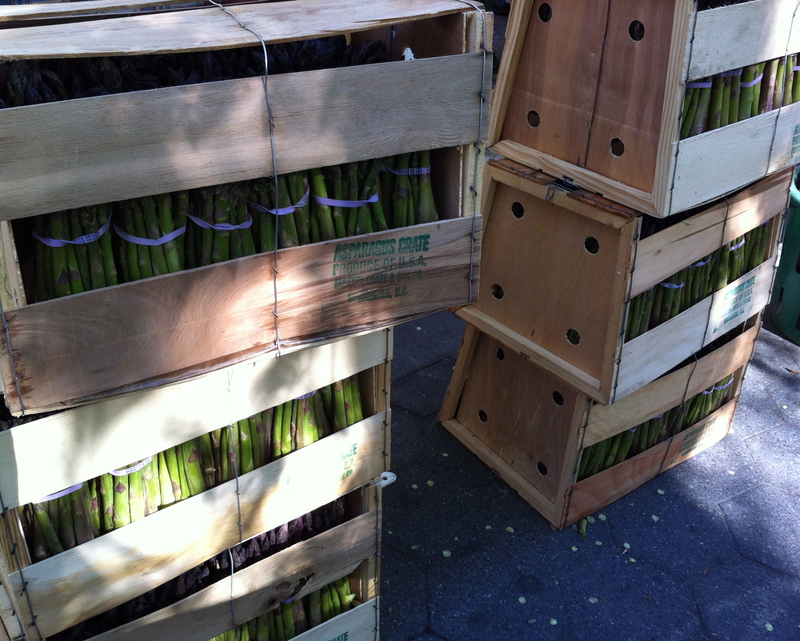 And the first local asparagus, which was mesmerizing. The California stuff I picked up at Easter was perfectly fine, but not in the same league at all. James Beard wrote about the first stalks of the season in American Cookery (1972): “Its fresh, pungent flavor never seems to pall. Do not plan to serve it sparingly.” I couldn’t agree more. I bought a few bundles from Stokes Farm (above). The fat, juicy-looking spears, tightly budded at the top, were impossible to resist. We didn’t waste any time. While I dealt with the flowers, Sam got busy at the stove and soon we sat down and dipped crisp-tender asparagus into soft-boiled eggs. Then we folded up the leftover spears in hot buttered toast and ate those over the sink. As far as cooking goes, we like to keep it simple. Just put the asparagus in a large skillet and barely cover with cold water. Bring to a boil and season with salt. Reduce the heat and simmer the asparagus, uncovered, until barely tender. Early that evening, we cooked another batch and enjoyed it cool, with a vinaigrette made with a couple of shallot bulbs. I barely had room for any roast chicken. The next night, we ate our asparagus warm, with brown butter. I had also hottened up the leftover chicken and a thin shingle of country ham, but I don’t know why I bothered. 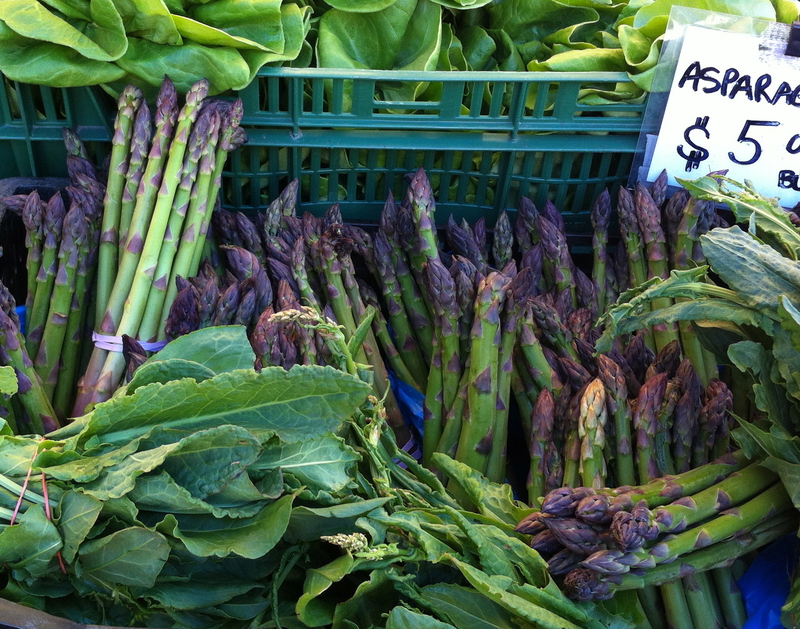 Asparagus is the crack cocaine of the vegetable world. And there will be more next week. Jane, I pretty much choked on my granola when I got to this gem: “Asparagus is the crack cocaine of the vegetable world.” If that doesn’t win any converts to your asparagus-worshipping I don’t know what will! Hodding! As I live and breathe. Lovely to hear from you; we must catch up soon….